Here is my tenth week of #100happydays. 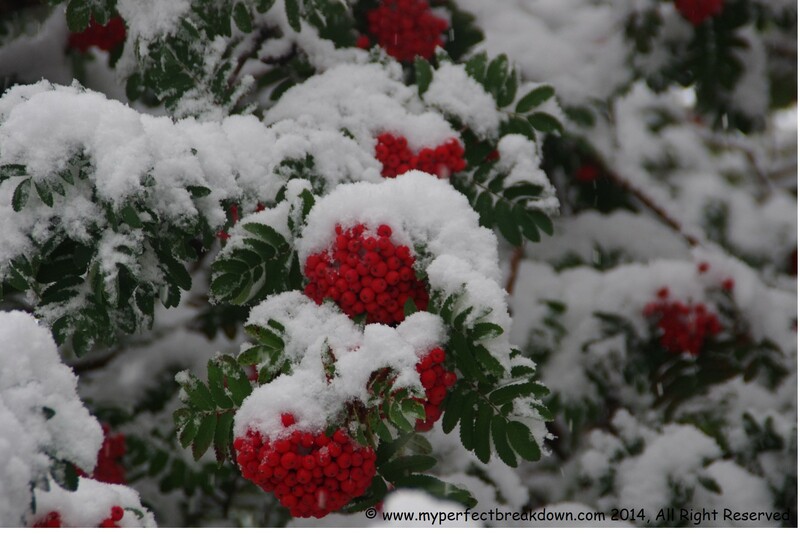 Day 64 – September 8, 2014: It is snowing today – the first snow storm of the year. There is absolutely nothing happy about snow on September 8th. But, I do love the beauty in fresh white snow against a backdrop of vivid summer colours. And, taking this photo made me smile and freeze all at the same time. 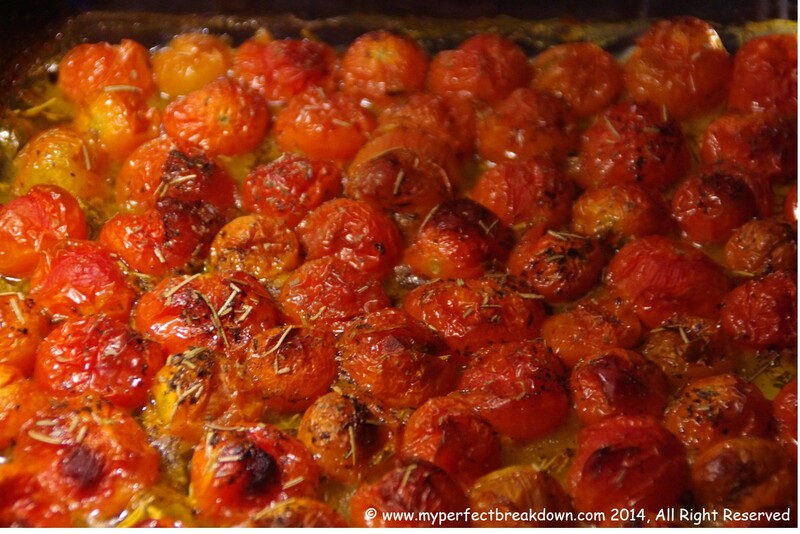 Day 65 – September 9, 2014: Roasted cherry tomatoes with basil and rosemary cooked in garlic macadamia nut oil – cooked by my husband using the tomatoes he rescued from the garden when the snow started falling. No joke, this might have been the most delicious thing I have ever eaten. Day 66 – September 10, 2014: It is snowing again – like massive amounts of snow. Roads are closed, tress have fallen down everywhere, and power is out throughout the city (including our house). Really, it’s depressing to see this much snow this early in September. Of course, sitting in my house with no heat, I assumed it would be a challenge to find a happy moment today. But, it turns out, playing scrabble with my husband by the fire to stay warm is definitely a happy moment! Day 67 – September 11, 2014: I spent today doing data collection and statistical analysis for a project I am working on. I am not passionate about numbers, and find this type of work rather painful. Needless to say, this meant I was extra happy today when my husband brought home my favourite flowers. Day 68 – September 12, 2014: Today wasn’t an overly happy day, in fact I literally only took 1 photo all day because I was grouchy and didn’t bother bringing my camera with me. So, I had a happy moment with a cream cheese pumpkin muffin at Starbucks, but I didn’t have my camera. Thankfully, I was in a better mood and remembered my camera when we went to dinner with some great friends. I took this photo to show a happy evening with friends. Lebanese anyone? 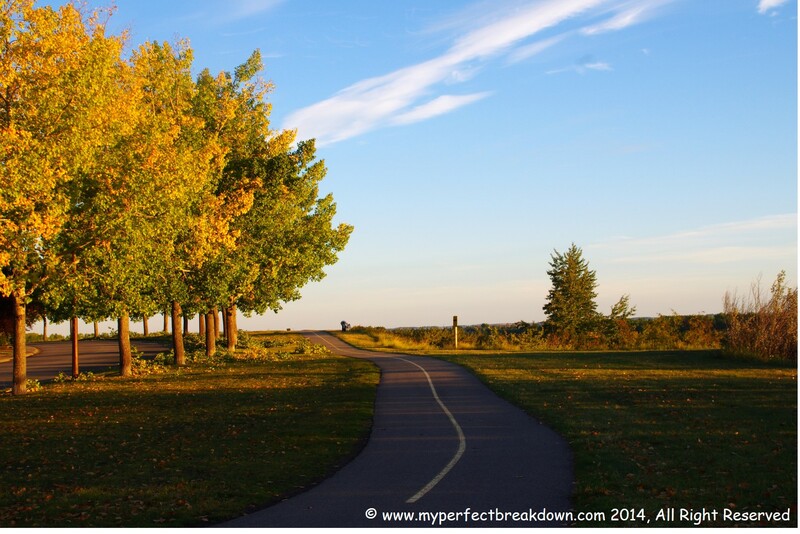 Day 69 – September 13, 2014: Finally, it wasn’t too hot or too rainy or to snowy for an evening walk with husband and dog. Being that she’s a 90lbs black furball, too hot is never a good thing. And, being that she’s a princess, rain is about the only time she prefers to stay inside. And, being that I hate snow in September, it’s about the only time I prefer to stay indoors. I’m now reminded of Goldilocks and the Three Bears and while I feel the need to go eat some porridge, I also feel the need to say – today was just right! We had a wonderfully happy family walk together – my husband enjoying the beautiful crisp fall air and his ability to walk more these days, our dog’s tail wagging the entire time and me snapping fun and happy photos along the way. P.S. I love that this path is just a few minutes away from my house! 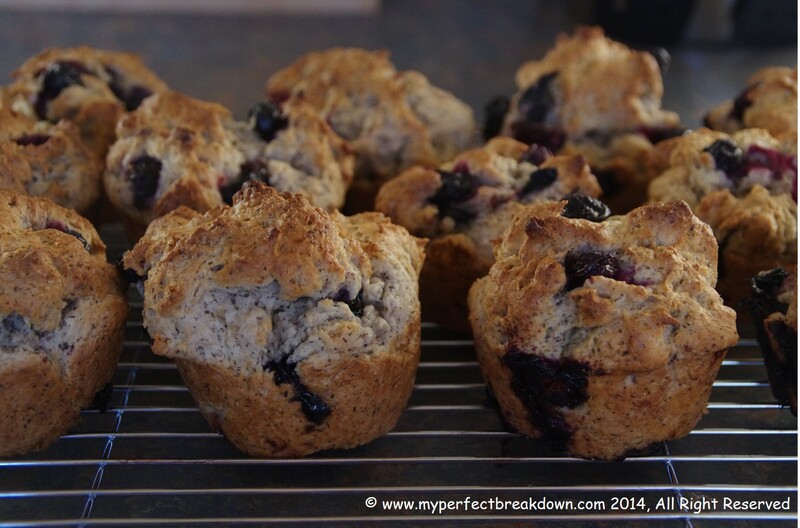 Day 70 – September 14, 2014: Holy Batman, these are gluten-free blueberry muffins are amazing, and it’s not often I say that about gluten-free food! Even my husband enjoyed them and went back for seconds! Thanks to Mama et Maman for sharing this recipe and inspiring today’s photo worthy happy (and delicious) moment! Wishing everyone a great week filled with happy moments! 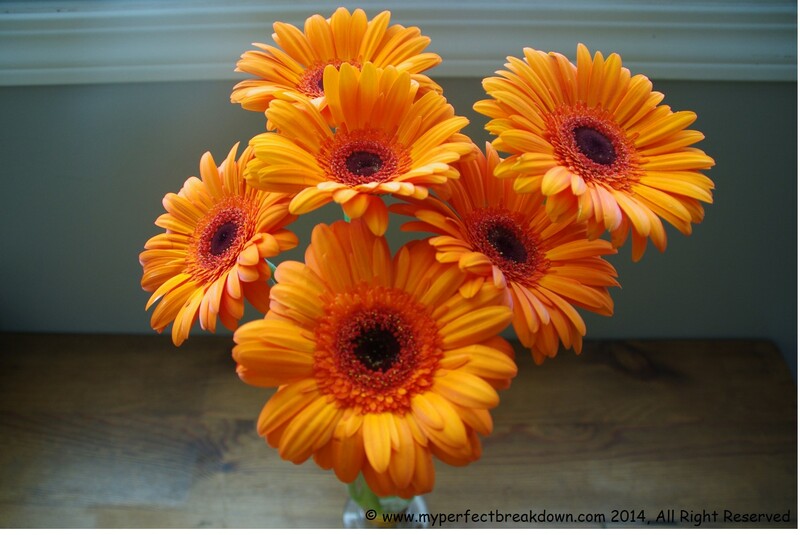 If you like this post, please feel free to share it and please return to myperfectbreakdown.com to follow my journey. Thanks! I have no idea what the actual names of the dips were – I didn’t order them, just enjoyed them!! My favorite was the red one. So yummy! That’s the muhammara! Kinda like a walnut and red pepper dip with pomegranate molasses. Ridiculously good! That photo is really pretty – but SNOW!?!?!!? AH!!! I don’t want to think about it, I am totally not ready for winter. Yup, snow! But it’s nice and beautiful out again, so as long as your not a tree in this city, your probably pretty happy! Loved this post with all the various thoughts and photos. Sadly, you’ve made me very hungry with the pics of the Lebanese food! And SNOW! Holy cow?! Where are you? It’s going to be 90F (32 C) today! And we’re lucky *if* we get a 50% chance of rain tomorrow! I’m in Texas, US (like I really needed to say “US” after Texas … like there is any other Texas on the planet!). But, the good news is we are back to sunshine and warmer weather (20C or 68F) with no snow in the forecast. So as long as you are not a broken tree, I suspect most people around me are happy with our weather now. That said, I would so much rather be in Texas with your weather right now!! Thank you so much!! I am truly honoured. Know that I too find your blog to be just lovely! I am so envious of your 109F weather!! I could use some of that, even if it meant giving up the warm oven in favour of ice cream and popsicles! Those tomatoes look AMAZING! I’m drooling just looking at that beautiful photograph of one of my favourite foods. I love the photo posts, I hope you don’t really stop at 100. Tomatoes are one of my absolute favourit foods. Which might explain why I loved these ones so much. I think my husband planned to use them in a sauce of some sort, but I just ate them straight up with a fork before he had the chance. Thanks so much for the compliment! In about a months time when we are permanently in winter, I would give anything for some heat. Oh, my Goodness! Snow already!? I am not envious of you at all!!! Love the photos and thoughts to go along with them. Thanks so much! That said, I completely agree about the snow. It’s just too early for snow! I’ve decided most of my blog followers must live in the southern US because all of you keep commenting on your hot weather! If only I could have some of that warmth! Definitely try those muffins as soon as you can turn the oven on again – they were amazing. I need to make another batch asap because they were so yummy! There are a lot of us in Southern Cali, I noticed! I know you’re in Canada but not sure where. I’ll enjoy the warmth for you (maybe). Stay warm! Can’t wait to try those muffins. I just took my second batch of muffins out of the oven – they are just so darn good that I think we have developed an addiction! Awesome! I’ve been dreaming about them! I love all these pics so much, especially the snow one! So beautiful! Also, we are in the middle of an insane heat wave and our A/C is not working again and won’t be repaired for a couple of weeks because we’ve decided to upgrade the whole thing and are waiting for a new condenser and evaporator coil to be ordered. I feel like I’m melting and want to transport myself into that photo right now! I would take that trade!!! I just took my second batch of muffins out of the oven bout 5 minutes ago – we are addicted! 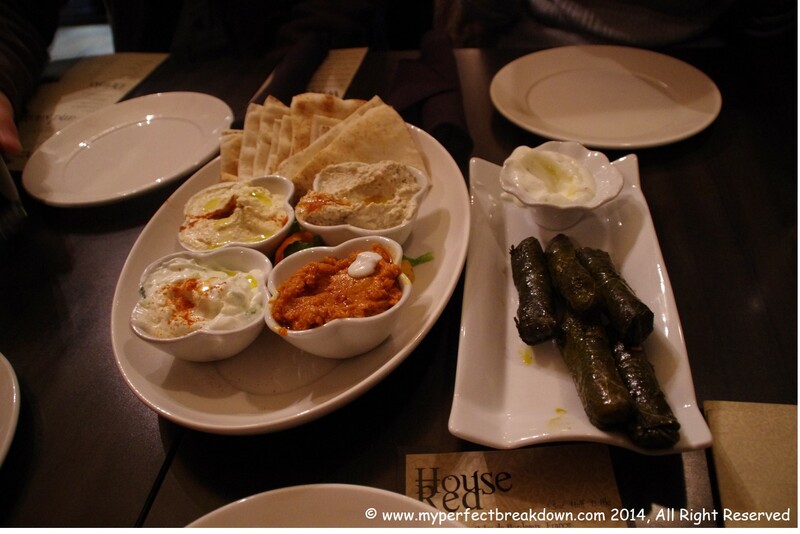 This was my first time having Lebanese, it was so good! I would definitely have it again! hey(: I really enjoyed reading this!